Please join Historic Palmyra on April 18th, 6:30-8:30 pm, for our Underground Railroad Walk and Program. This program is part of our 3rd Thursday community participation programming and is no charge to attend; donations are welcomed. Event attendees will be meeting at the Alling Coverlet Museum, 122 William St., Palmyra at 6:30 pm. We will be having a talk about the relationship between Palmyra and the Underground Railroad and discussing many of those involved in the Abolitionist Movement in the Palmyra community. Author and historian Marjory Perez will be joining us to speak about her newest book, Freedom, A Shared Sacrifice! : New York’s African American Civil War Soldiers, and the Underground Railroad. The talk will be followed by a walk around the Village with Bonnie Hays to see sites related to the Underground Railroad. 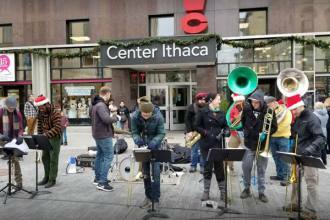 Here’s What’s Happening in Downtown Ithaca!